“The growing drugs problem affects us all”, thought CEO Gerhard Wenger in 2008, upon hearing about an incident at a school in Schwabach. The police had discovered a drugs ring that had been encouraging young people to deal drugs at school. Mr Wenger immediately set about finding an appropriate way to take part in the fight against drugs. 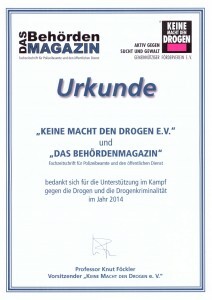 Since then, Astute Logic GmbH has supported the fight against addiction and violence with a yearly donation to the “No Power to Drugs” association (“Keine Macht den Drogen e.V.”). The “No Power to Drugs” association supports various campaigns with a preventative focus for young people in schools and youth centres, explaining the realities of taking drugs and actively combating drug use. Because it is a private organisation, cooperation partners, members and donations are of vital importance. 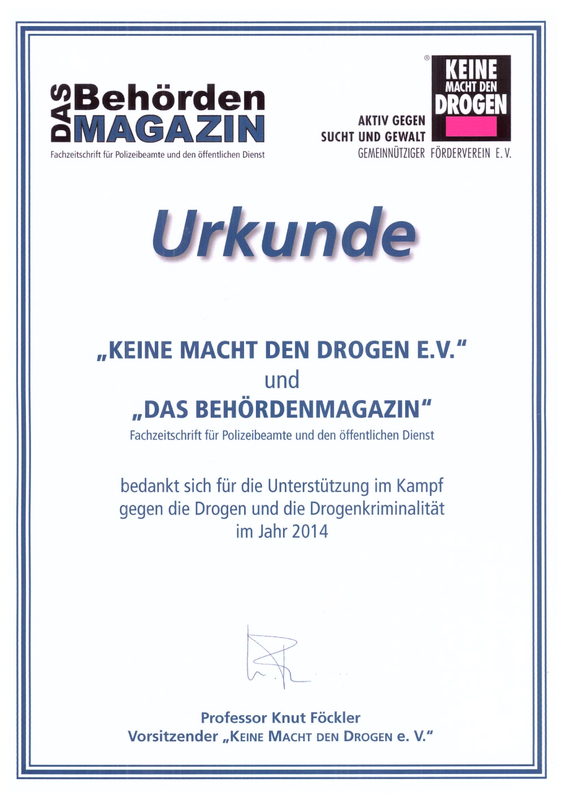 In cooperation with the trade journal “Das Behördenmagazin”, Professor Knut Föckler, the chairman of the “No Power to Drugs” association, thanked us for our support in the fight against drugs and drug-related crime throughout this year. We would like to express our gratitude for the certificate and for the recognition of our support.